If you’re looking to get off the beaten path in the U.S., take a drive through Alabama, where local diners, notable historic sites and sprawling beaches compete for your attention. The Alabama Tourism Department has put together a series of 80 road trips designed to give visitors a guide for great two-or three-day getaways. Each of the road trips highlights the attractions, accommodations, restaurants and special events in the area. Visitors will also find great behind-the-scenes advice since each of the road trips was written by one of Alabama’s own veteran tourism department staff members or by local travel writers. Destinations featured in the road trips include the U.S. Space & Rocket Center in Huntsville, the scenic beauty along the Lookout Mountain Parkway, Birmingham’s historic Five Points South neighbourhood, a Football Championship Tour of Tuscaloosa and Auburn, the Selma to Montgomery Civil Rights Trail, a romantic getaway to Mobile and family fun on the white sandy beaches of Gulf Shores and Orange Beach. 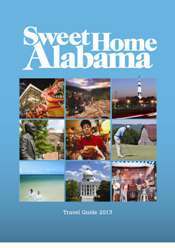 All the Alabama Road Trips are available online and also available for download as a smart phone app on the website - download here. Download the Free Alabama Road Trips app today to get started. Click on the image to download guide. Our Travel Guide, Maps, Brochures and Videos can all be downloaded here or view our Deep South guide online. If you cannot find what you are looking for please complete our enquiry form and we will be happy to help. Travelling through the Deep South is a history lesson in itself!